Understand the rock-paper-scissors system of both attributes and weapons. This is important because while you can level up your characters and plow your way through the first 6 or so chapters through stats alone, the game grows increasingly more difficult and Metal Zone farming will only get you so far. For example, Chapter 11 has you fighting level 35+ enemies and Metal Zone 3 doesn’t open until after Chapter 12. 😛 Granted, the recommended levels in Ch 11 stages are in the high 20’s, but if you’re just randomly throwing together a team of your favourite characters, you might just end up having a difficult time because the weapon & attributes of enemies trump yours. Before starting a stage, review the Tactical Info box above the Start Battle button and adjust your team accordingly to minimize the chances of giving the enemy an advantage. If the info is informing you that 9 archer type enemies will be popping up on the battlefield, try not to bring a party comprising mostly of spear users. If you have no choice then consider hanging back and levelling them a bit. You’ll even get coins from doing this which means a visit to the Tavern to recruit new folks may be a good idea as well. Consider taking a chance and spending some Stamina on the Pact of Truth at the Tavern. After completing an entire chapter, you will receive 1 Stamina. The game may also provide you with Stamina as login bonuses! Of course, you can also purchase some at the Shop as well. Regardless of how you obtain it, you have a chance of receiving B to SS class “named” characters when recruiting through the Pact of Truth! These particular individuals generally have higher stats and the ability to change jobs. My opinion: Change jobs if the game is putting up a fight. Certain skills unlock at certain levels and all 3 job types have different skills. 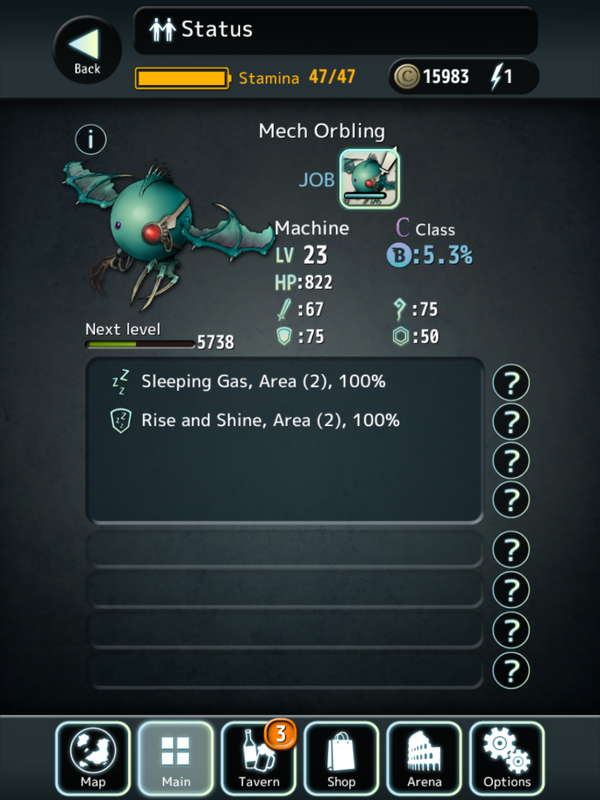 As you pump up the character’s new job, the new skills will unlock and you can attach them to another job. On top of this (and as far as I know), their stats get better the “higher” the job so job 3 stats dwarf the ones from job 2 and job 2 stats are stronger than job 1. 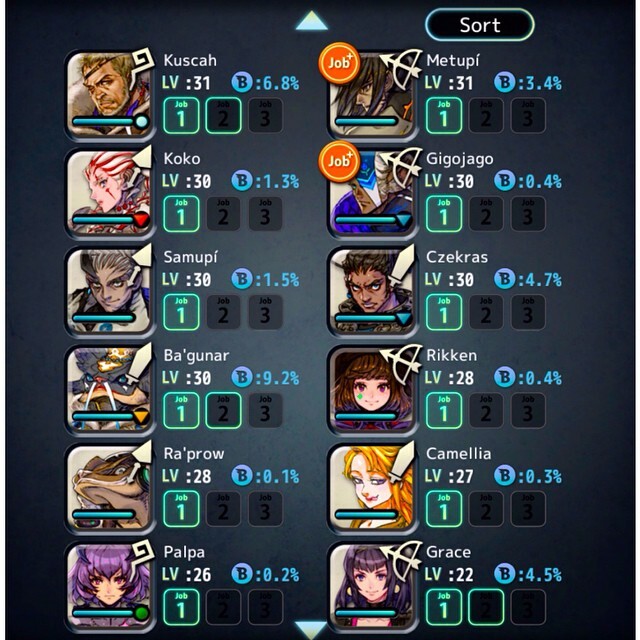 The only problem is, when you switch a character to a new job, he/she starts from the bottom at level 1 so at some point in time, you’re probably going to have to spend some quality time with Metal Zone 1 again (or you can always bring the low level character as fodder on a higher level stage since they’ll gain EXP even if he or she dies. Not that I actually recommend this unless the remaining party members can stay alive and wipe out everything on the board without issue). And yes, you’ll need materials before you can even add a job. Visit the Hunting Zone everyday! http://www.terrabattlex.com/zones/hunting has a list and some tips for the daily dungeons. You’ll obtain much-needed items for jobs from each hunting zone! Please note that Saturday and Sunday dungeons only yield coins and there is no Hunting Zone open on Mondays. Metal Zones are the key to levelling up. They’re there to cut down on the immense amount of grinding you’d otherwise need to put up with just to beef up your party members. It may just be me but I find that it’s really difficult to level up characters simply by going through chapters once they reach level 10. Maybe it has something to do with the fact that I was mostly overlevelled compared to the recommended level for a stage. XD But even then, bringing a character that was about 10 levels lower than the party average never really yielded as much experience as I feel that it should have. So to remedy the puny EXP gains from story chapters, there are Metal Zones that contain monsters that’ll provide you with lots of experience points! As of this writing, the game has yet to implement a notification system that’ll tell you when a Metal Zone is open. 😦 However, fans have put this together: http://www.terrabattlex.com/zones/metal_zone_schedule Incidentally, there’s also a Metal Zone in the Arena but that one requires Metal Tickets to enter and for now, it seems to only cater to characters under level 20; basically, it’s just like Metal Zone 1. 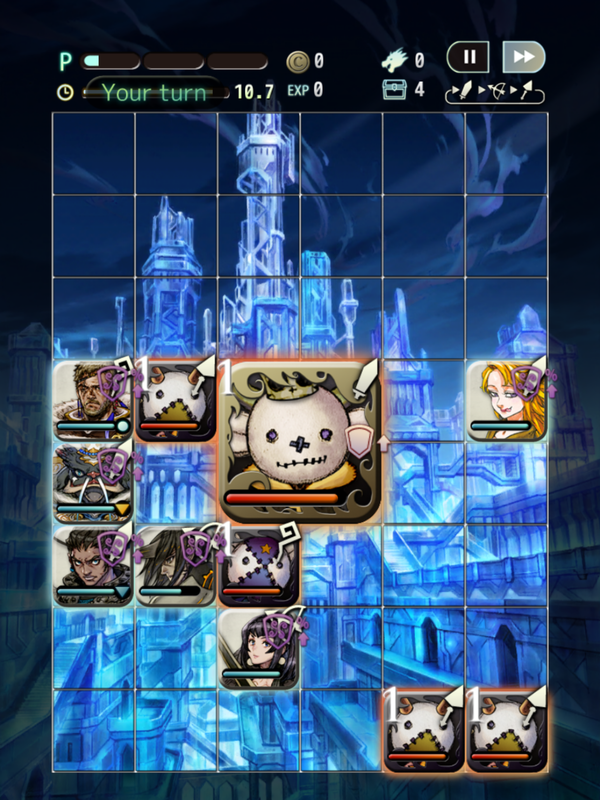 If you want to conserve stamina and go the normal route, this thread over at the Terra Battle Forum has some tips! Don’t feel pressured to defeat every single enemy in a Zone. Whether it’s a Metal or Hunting Zone, your goal is to survive to defeat as many enemies as you possible can. Such is the case in the Hunting Zone known as Puppet Show where you only have 12 seconds total to make your moves so quick, short moves are vital! If you know of any other sites, please comment below!